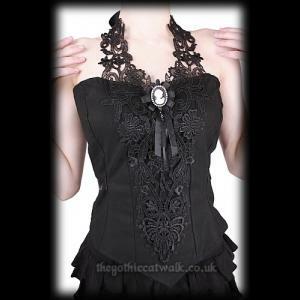 An unusual gothic steampunk princess-seamed bodice top made from stretch cotton poplin with black applique detail down the centre front which extends over the shoulders. The lace is attached to black satin ribbon ties and fastens at the back of the neck. The bodice comes with a cameo brooch of a woman mounted in a frame decorated with sparkling clear crystals set against a black ribbon and lace rosette. The back has a full length zip and there are two ribbons sewn in the front seams to tie at the back of the waist. Bust: 30" Waist: 26" Length: 15"
Bust: 32" Waist: 28" Length: 15"
Bust: 34" Waist: 30" Length: 15"
Bust: 38" Waist: 34" Length: 16"
Bust: 40" Waist: 36" Length: 16"